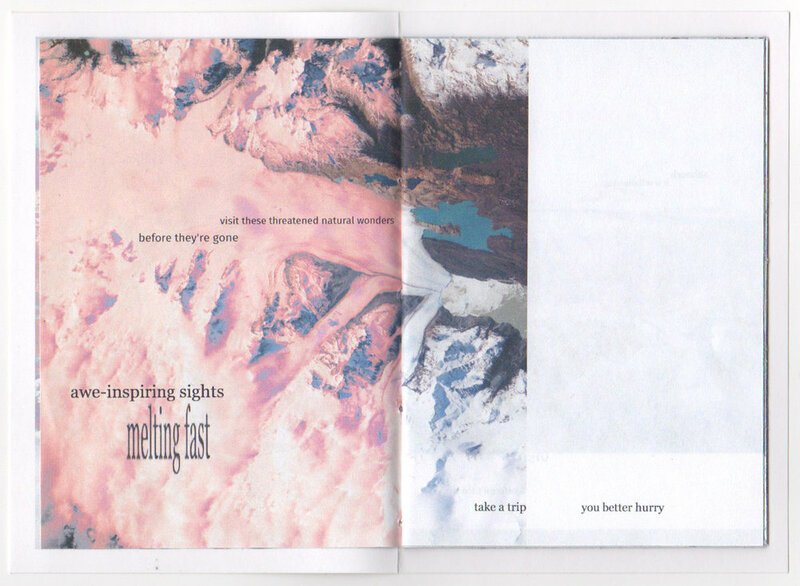 Aside from a few passages sourced from Instagram captions, all of the text in this zine about extinction tourism (focusing specifically on glaciers) was extracted from online articles published by travel magazines in recent years. These articles tend to follow a similar pattern: They brandish several alarming statistical figures regarding the retreat of glaciers as they urge readers to "visit before it's too late." Meanwhile, they consistently fail to acknowledge the glaring irony at hand—that the air and sea travel required to "access the incredible views" will only contribute to further degradation of the landscape. Snippets of text from different sources were collaged together and set against a backdrop of digitally manipulated photographs of glaciers from around the world. The title, see the world, see it burn, references the lyrics of ANOHNI's climate change anthem "4 Degrees." You can leaf through the zine below, and purchase a physical copy here.